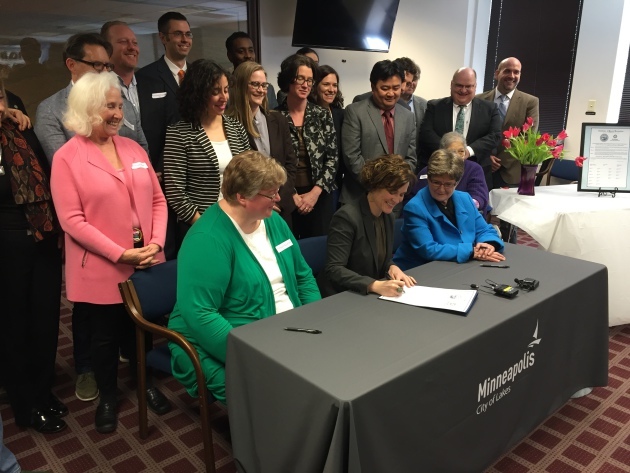 Above: A signing ceremony featuring Mayor Hodges and members of the City Council followed the vote. A momentous $800 million deal to breath new life into Minneapolis' crumbling roads and parks received enthusiastic and unanimous approval Friday by the City Council. The plan would pump about $22 million a year into new street repairs, and $11 million into park renovations and maintenance -- adjusted annually for inflation. It will be paid for largely through issuing debt and raising property taxes (see here for more details). "The commitment we are making today for our streets and for our parks will allow us to meet our duty to the generation before us, who built the Minneapolis we inherited," said Mayor Betsy Hodges. "And our duty to the generations that will follow, to ensure they inherit a city that works for through 21st Century." The deal was unveiled and signed within a week -- lightning-fast pace at City Hall -- without any significant public opposition from city officials. It comes about five months after the Park Board announced it would seek a referendum on $300 million in repairs, which is now unnecessary. "I have worked on some of the biggest issues of our time, like many others who have come before me. But I think this one rises to a higher level," said Council Member Lisa Goodman. "Mainly because of where we are right now as a society, with so much negativity towards each other. And so much negativity about government and the role of government." Council Member Kevin Reich, who chairs the city's transportation committee, said his committee will discuss the criteria for road investments in the coming months. The infusion of cash also comes as the city seeks a new public works director, who will ultimately be instrumental in carrying out the plan. The Park Board has already outlined which of the city's 157 neighborhood parks will take priority, based on a criteria that factors the condition of park assets and the amount of racially-concentrated poverty in the area -- as well as youth population, density and crime statistics. The semi-independent Park Board must still pass its version of the ordinance approved on Friday. A public hearing will take place on May 18.